For all of you tea drinkers coming to the U.S. and expecting what you are used to at home, I present this list as a sort of public service. We Americans are a breed apart…a distinctly odd breed in some ways. And wonderfully unique in other ways. Tea drinking is one of them. I selected some of the top ways that we Americans enjoy our tea that are unique to us. Yes, there are others, but I am limited on space here! As a diehard hot tea drinker, I kind of hate to admit this, but it seems to be true. 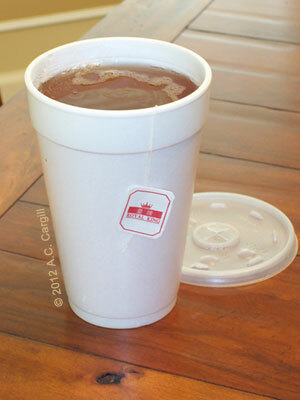 Though most popular in the Southeastern states and served loaded with sugar as “Sweet Tea,” iced tea, both sweetened and unsweetened, is popular throughout the nation, especially in hot weather (though some are known to drink their tea iced even when their local temps have plunged well below freezing). An estimated 85% of all tea consumed by Americans is said to be iced, and a lot of that these days is also flavored (lemon, strawberry, mint, raspberry, and peach are popular). A lot of teabags in the stores say “for brewing iced tea” on them and have been blended to steep up strong enough not to go flat when that ice is added. Most Americans drink their black tea with only some sweetener, additives like lemon, or pre-flavored (such as Earl Grey or a spiced chai). You should see the looks I’ve gotten from waitresses in restaurants (usually when they think I’m not noticing) when I reject the lemon and honey they bring with the tea and ask instead for milk or cream. They usually bring forth those little containers of about an ounce of a thickish white liquid that is supposed to be cream. Some actually bring a little metal cream pitcher full of what seems to be whole milk. The British say, “Time for tea” and often mean a meal, not just a nice cuppa. Their tea meals include Elevenses, Afternoon Tea, Cream Tea, and High Tea. In the U.S. we grab a mug of hot water and a teabag (those of us not smart enough to own IngenuiTeas, that is), dunk the bag a few times, slurp the liquid down, and wonder why it tastes so bad. You have to attend a tea party or go to a tearoom, hotel, or restaurant when they are serving their special tea menus. Another option, of course, is to befriend someone versed in a proper tea time. The Brits go for their basic black tea, usually one of the popular brands, but thanks to a certain coffee vendor who now is delving into tea, here in the U.S. a variety of concoctions are now available. From Spearmint Green and Jasmine Orange to Vanilla Rooibos, they crank out cupful after cupful. Some other tea companies here in the U.S. promote teas full of all kinds of flavorings, smothering the green, oolong, and black tea leaves with various fruits, spices, and flower petals. The variety seems boundless. And rather mind-boggling to tea drinkers from other countries. The average American has no idea what a builders’ tea is. Nor do we ask for our tea “white without” or if we shall be mother when it’s time to pour the tea. We use phrases like “make it strong enough to dissolve the bowl of a spoon” or “add some milk to that tea” or “here, let me do the pouring.” Rather simplistic and straightforward. Not only do the waitresses stare at my request for milk or cream for my tea (as discussed in #2 above), I stare at them when they bring me that lukewarm water and the teabags full of stale dust (or even herbals masquerading as true teas). Having ordered tea, my surprise is hardly…well, surprising. But that is how it is even in some of the finest restaurants in the U.S. – for one reason, not enough customers order tea, but then maybe they don’t because they know they’ll get served such a disgrace. It seems to be a chicken and egg situation – tough to know which comes first. There you go, visitors to the U.S. – I certainly hope this helps you deal with our heathen tea drinking ways when you are so used to a civil cuppa in your own country. Enjoy! No surprises here. Everything mention I’ve already experienced. Not only are Americans ignorant about teas, they refused to be educated about them. I’ve gone so far as to offer to buy tea services for an entire restaurant, but had no luck whatsoever. Yeah, I understand. When dining out, I now just have water with the meal and rush to the teapot when I get back home! Being Australian and visiting the US for the first time last year, I tend to agree with the list, it can be rather disconcerting. Most of it didn’t worry me, though, and I have probably made and drunk three times as much iced tea this (Australian) Summer. I’d rather see RTD Teas filling the shelves – though most of them are awful – than other drinks. The point about milk is well made – Australia has a different view to the Brits and the Seppos (that’s a fond term for Americans) here. In Australia, milk is optional. In Britain, it’s very hard to get them NOT to put it in, and in America, it’s like a game where they just don’t want to give you milk.”Here have some creamer (foul powder)”. “Here, have some half-and-half” before you grudgingly get some milk. Excellent article, and yes.. my wife and me are two of those crazy Americans that drinks iced tea, year round, even in subzero weather!! !